Makhani literally translates to butter sauce and the Restaurants do use it liberally, making the dish very greasy and weighs you down. I have reduced the amount of butter to suit my family taste and health. This is just enough to bring out the flavor of butter in the sauce rather than using it as a fat to cook in.The home version is so much lighter and flavorful. This is regular favorite in my home and the best compliments came from my dad. Last summer he visited us and enjoyed it so much saying that my version tasted better than the Restaurant one. In fact he requested me to make it couple of times. 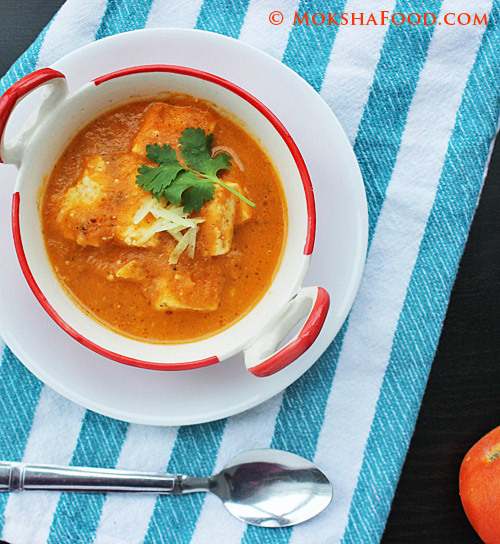 Purist make Paneer Makhani without any onions. I have made this recipe numerous times with and without onions and both versions taste good provided the onions don't overpower the subtle tomato cream flavor. So if you choose to go for it then use less than 1/4 cup of onions. 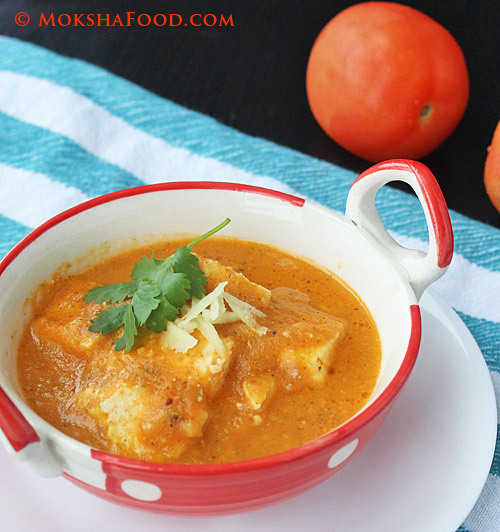 The slight bitterness of the kasoori methi or dried fenugreek leaves added at the end complements the sweet and creamy taste of the tomato cream sauce perfectly. In a saucepan, melt half the butter and oil and heat to medium. Flavor the oil with mace blades and gently crushed cardamom pods. Once they release their aroma, add chopped garlic and saute for few minutes. Now add the tomatoes and let it cook till pulpy. Cool, remove the mace blades and cardamom green husk and blend the tomatoes to a smooth paste. In the same pan, heat the remaining oil. Add in the green chili and grated ginger and saute for a min. Pour in the tomato puree. Flavor with salt, kashmiri pdr and garam masala. Sweeten with honey and simmer the sauce for 5 mins. Pour in the half and half. Drop in the Paneer pieces and mix well to coat with gravy. Let it cook for 5 minutes more. Crush the dried kasoori methi and the julienne ginger on top and switch off the flame. Drop the last half of the butter and let the flavors develop for some more time. Serve with Gluten Free Naan or Jeera rice (cumin rice) or rice pilaf. The tomato paste can also be put through a strainer to get a finer texture of the sauce. I do it when serving guest.